Digi-Dallies: Guess Who! Yup.....more pics of UK! Guess Who! Yup.....more pics of UK! I finally finished the Digi in Deep, v.2 class. I've had the last lesson to do for more than a year now and I thought it was high time to complete the course. I'm super glad I did, because it made for a spectacular layout of James and his birthday gift from Grandma & Papa John. Click on the picture to get a really good-sized view and you can read the journalling, as well. The very edge of the large, black & white photo is the left hand side of the page. The remainder, of course, is the right hand side of the page and they will be printed separately and placed in my scrapbook as facing pages. I'm very pleased with this layout and will soon be using it again, with different photos and pictures (think Australia and Tiffany). 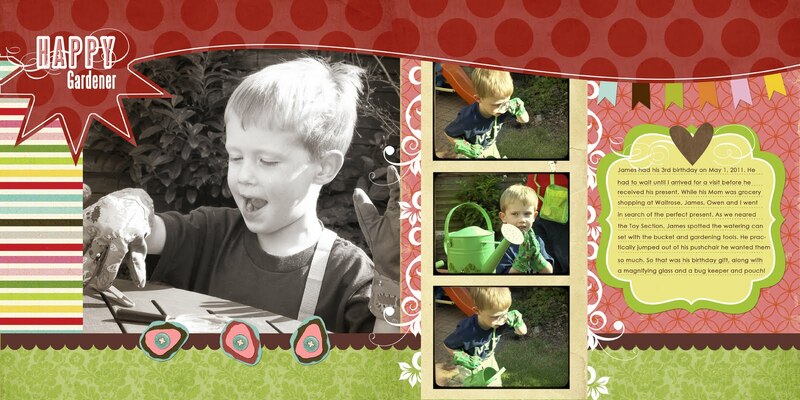 The gardening set is the gift James wanted for his birthday. I waited until I was in London so I would have the pleasure of seeing his face light up when he found just what he wanted. All I can say is thank goodness it was the gardening set and not a real, regular size car!!! End of the School Year is coming fast! Paris -- Ooo La La!